This 58-year-old man received treatment (surgical excision followed by radiotherapy) for nasopharyngeal carcinoma one year ago (Fig. 1). 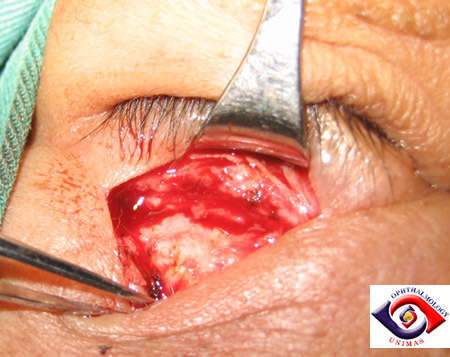 He presented recently with a swelling in his right lower lid and a vertical diplopia. Examination revealed normal vision in both eyes. He had a right proptosis with hypertropia and restricted downgaze. A hard mass was palpable along the inferior orbital margin. He had no complaint of epiphora. A CT scan was performed which revealed a mass (Fig 2) in the orbital floor without bony destruction or cavernous sinus involvement. Biopsy of the lesion (Fig. 3)showed a white firm mass and the histology revealed a moderately differentiated squamous cell carcinoma consistent with the previous histology of his nasopharyngeal carcinoma. Endoscopic examination of the nasal cavity and the right maxillary antrum were unremarkable and the biopsy in these areas showed no malignancy. The orbital lesion was diagnosed as metastatic nasopharyngeal carcinoma and the patient underwent radiotherapy. Figure 1. 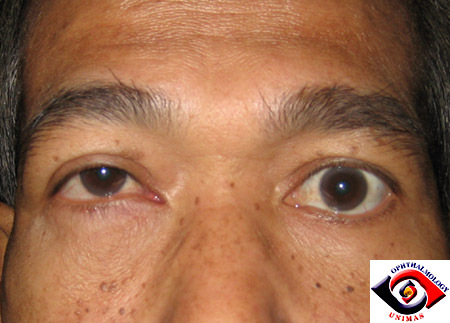 Right hypertropia and proptosis. Figure 2. CT scans a diffuse mass involving the inferior orbit. No bony destruction is seen. revealing a white firm mass in the orbital floor. a. What is the geographical distribution of nasopharyngeal carcinoma (NPC)? b. Is orbital metastasis a common way for nasopharyngeal carcinoma (NPC) to invade the orbit? c. Is the histology seen in this patient typical of nasopharyngeal carcinoma (NPC) in this part of the world? d. What is the relationship between Epstein Barr virus antibodies and nasopharyngeal carcinoma (NPC)? e. What is the prognosis for this patient?